Tomato Tomatoes come in many different varieties, sizes, and shapes. From cherry tomatoes to Heirlooms and Mighty Matos. Tomatoes can be eaten fresh, canned, or frozen. A determinate tomato will produce fruit for a specified amount of time and will usually be bushy plants while an indeterminate tomato will produce over a longer period and may need staking. Early Girl Tomato This tomato is ‘Mountain Grown’ at Alpha Nursery and is an ‘Idaho Preferred’ Plant. It is also grown organically. Early Girl Tomato will begin producing tomatoes earlier than other varieties. This is an indeterminate tomato. It will grow from 30" to 32" tall and 24" to 28" wide. Plant in full sun and well drained soil. Early Girl Tomato is a mid size slicing tomato and a good producer. This tomato is organically grown. This tomato will mature in about 60 days. Sun Sugar Tomato This tomato is ‘Mountain Grown’ at Alpha Nursery and is an ‘Idaho Preferred’ Plant. It is also grown organically. Sun Sugar Tomato is a cherry heirloom tomato. It is an indeterminate tomato that will produce abundant amounts of orange, cherry tomatoes throughout the summer. It will grow to a height of 36" tall and 36" wide. Plant in full sun and well drained soil. Sun Sugar Tomato will mature in about 62 days. Roma Tomato is an old favorite determinate tomato that is great for making sauces and paste. They are egg shaped and have very few seeds. This tomato is meaty and drier than cutting tomatoes. Plant Roma Tomato in full sun. 75 days to maturity. Gardener's Delight Cherry Tomato This tomato is ‘Mountain Grown’ at Alpha Nursery and is an ‘Idaho Preferred’ Plant. Gardener's Delight Tomato is an Heirloom indeterminate cherry tomato with extra sweet flavored round fruits. These are great for eating right off the vine or for salads. They will produce 6 to 12 fruits in each cluster. 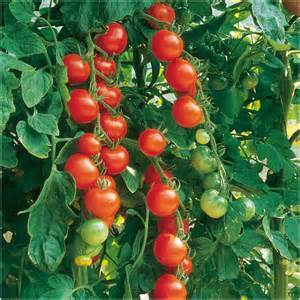 Gardener's Delight Tomato will grow to a height of 6' to 7' tall and 5' to 4' wide so be sure to stake this one. Plant in full sun and well drained soil. Gardener's Delight Tomato is organically grown and will mature in about 65 days. Mortgage Lifter Tomato This tomato is ‘Mountain Grown’ at Alpha Nursery and is an ‘Idaho Preferred’ Plant. It is also grown organically. Mortgage Lifter Tomato is an Heirloom tomato that is highly prized for its sweet pinkish flesh. It produces good yields of 16" to 24" tomatoes. This tomato is great for slicing, canning, and sauces. Mortgage Lifter Tomato is an indeterminate tomato reaching heights of 3' to 4' tall and 2' to 3' wide. Plant in full sun and well drained soil. Mortgage Lifter Tomato is organically grown and will mature in about 80 days. Yellow Pear Tomato This tomato is ‘Mountain Grown’ at Alpha Nursery and is an ‘Idaho Preferred’ Plant. Yellow Pear Tomato looks just like a , well, a yellow pear. This is an Heirloom Tomato that has mild, sweet, delicious flavor perfect for salads or fresh eating. It will grow from 2' to 3' high and 18" to 24" wide. Plant in full sun and well drained soil. Yellow Pear Tomato is indeterminate and will mature in about 70 to 75 days. Try something unusual by growing this tomato. Yellow Pear Tomato is organically grown. Mighty Mato Like superheros, Mighty Mato grafted tomatoes are stronger, faster, more able to fend off foes than regular tomato plants - and their harvests are bigger. Mighty Mato goes above and beyond the call of duty, defending against pests, diseases, temperature extremes, and poor soils while producing long, abundant harvests of tasty fruit! Grafting joins the top part of one plant (the scion) to the root system of a separate plant (the rootstock). As their tissues heal, they fuse into one super plant that combines the rootstock's vigor and disease resistance with the scions's exceptional fruit quality. Non-GMO. The graft must stay above the soil level, and prune lateral suckers for best fruiting. Early Girl Mighty Mato will begin producing tomatoes earlier than other varieties. This is an indeterminate tomato. It will grow from 4' to 5' tall and 2' to 3' wide. Be sure to cage or stake this tomato. Plant in full sun and well drained soil. Early Girl Mighty Mato is a mid size slicing tomato and a good producer. This tomato will mature in about 50 to 60 days. 42 Days Mighty Mato Tomato is the earliest tomato available. It produces abundant amounts of cherry tomatoes. Be the first in your neighborhood to have fresh cherry tomatoes. Great for fresh eating and salads. It will grow from 4' to 6' tall and 2' to 3' wide so be sure to stake this tomato. Plant in full sun and well drained soil. 42 Days Mighty Mato Tomato will mature in 42 days. Mortgage Lifter Mighty Mato Tomato produces abundant amounts of 1 1/2 pound tomatoes. Great for fresh eating and slicing. It will grow from 4' to 6' tall and 2' to 3' wide so be sure to stake this tomato. Plant in full sun and well drained soil. Mortgage Lifter Mighty Mato Tomato will mature in 85 to 90 days. Sweet Million Mighty Mato Tomato produces abundant amounts of sweet cherry tomatoes. It will grow from 4' to 6' tall and 2' to 3' wide so be sure to stake this tomato. Plant in full sun and well drained soil. Sweet Million Mighty Mato Tomato is an indeterminate tomato and will mature in 75 days.